Chihuahuas were once prized by the Toltecs of ancient Mexico, and the breed continues this regal tradition today as a popular companion breed. Many Chihuahua owners enjoy grooming and dressing up their dogs, and hair bows are a simple accessory to give your Chi a little extra flair. Short-coated Chihuahuas are more difficult to bow than long-coated ones, but bows are still an option with a little ingenuity. Bathe your Chihuahua before putting on bows. Fill your kitchen sink with 2 inches of warm water and gently set the dog in the water. Use a cup to pour water over the dog's coat and drizzle dog shampoo along the spine. Distribute the soap with your hands, taking care to wash the dog's head and ears. 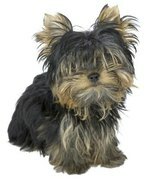 Rinse the dog with clean water, towel dry and brush with a soft dog brush to remove loose, dead hair. Short-haired Chihuahuas get chilled easily, so make sure the dog is completely dry before allowing it to go outside. Press an adhesive bow just above each of the Chihuahua's ears. These bows are sold in the baby section of many stores and are pre-tied with a drop of pet-safe adhesive on the back to stick to even the shortest hair. Adhesive bows are a useful short-term bow, as the glue will dry out and the bow will fall off quickly. Trim a small circle from a roll of double-sided tape and press a hair bow on the top side of the tape. Press the bow against the dog's hair and hold it in place for a few seconds to form a secure bond. The Chihuahua's coat is short and thin, but double-sided tape is sticky enough to keep the bow in place for a few hours. Place a drop or two of non-toxic hair glue to the back of a bow and push the bow gently onto the dog's fur. Hair glue is often used to attach weaves and extensions in human salons and is safe enough to use on a Chihuahua. Hold the dog in your lap and apply pressure to the bow for at least 60 seconds, or until the glue fully dries and the bow stays in place.